Interstate 275 forms a western bypass of Detroit from north of Monroe to Romulus, Detroit Metropolitan Wayne County Airport (DET), Canton and Livonia. 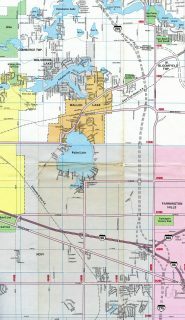 The freeway was originally planned to reconnect with Interstate 75, following a path just west of West Bloomfield and Waterford. It was not completed as U.S. 23 already provided a long distance bypass between Toledo, Ohio and Flint. 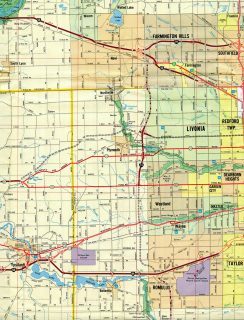 I-275 traverses mostly rural areas of northeastern Monroe County to the east of Carleton into semi-rural areas of western Wayne County. The freeway leads north to Eureka Road (Exit 15), which provides access to Detroit Metropolitan Wayne County Airport (DET) for travelers originating from Monroe and Toledo to the south. The route shifts westward from the airport perimeter to cross paths with Interstate 94 in Romulus. The remainder of Interstate 275 north parallels Haggerty Road as a commuter route along a mixture of industrial areas, apartment complexes and business parks. A large directional cloverleaf interchange at Livonia brings Interstate 96 north onto I-275 west from the Jeffries Freeway opposite the M-14 freeway west to Ann Arbor. 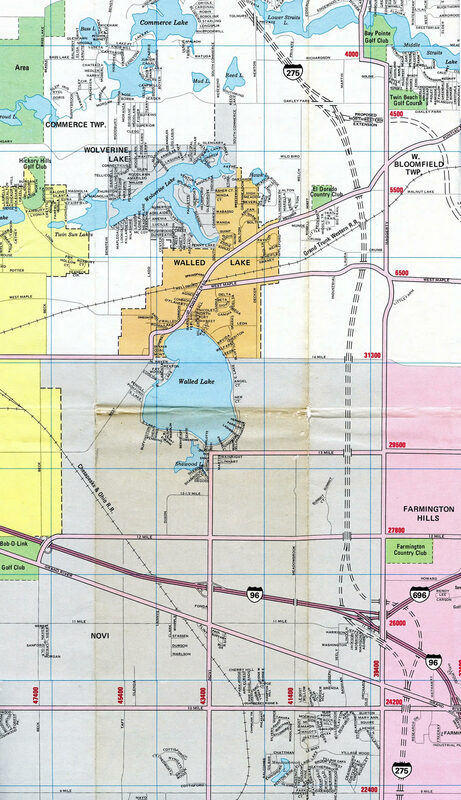 The two routes share approximately 5.7 miles of pavement north along a commercialized corridor to Farmington Hills and Novi. I-275 ends at a large interchange complex where I-96 resumes a westward heading to Lansing, I-696 ties in from Southfield to the east and M-5 intertwines from Farmington to Novi. 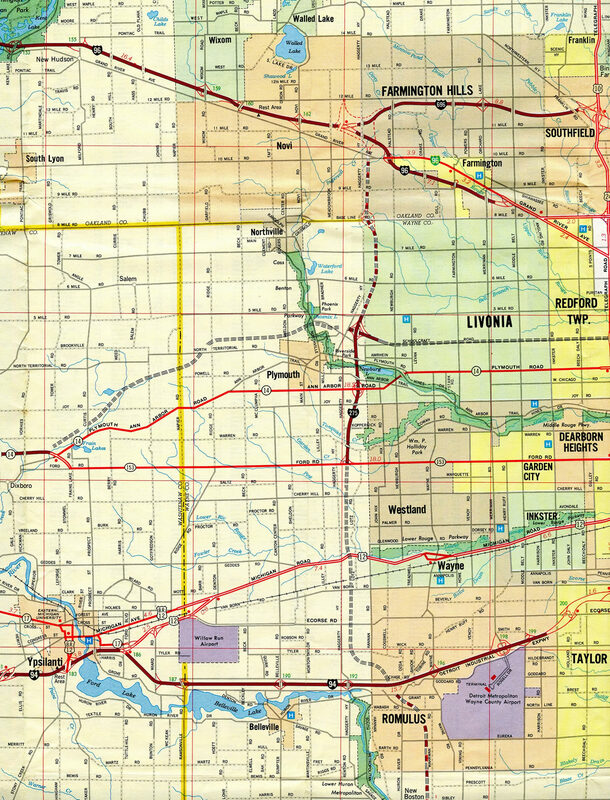 Very few maps showed the unconstructed section of I-275 leading north from I-96 and 696 at Novi back to Interstate 75. A five mile stretch of this route was eventually built as the Haggerty Connector (M-5). The third in a series of diagrammatic signs outlines the separation of Interstate 696 west with the two-lane off-ramp (Exit 1) for M-5 north, M-5 south and Interstates 96 east & 275 south. Photo taken by Scott Steeves (11/05/06). Exit 1 veers away from Interstate 696, as the freeway defaults onto I-96 west in 1.75 miles. A long ramp turns southward to pass over M-5 and merge onto the left-hand side of I-96 east and the southbound beginning of I-275 as the pair head south to Livonia. Photo taken by Scott Steeves (11/05/06). The first sign for the interchange complex with Interstate 275 south, I-696 east and M-5 north appears one mile ahead of Novi Road on Interstate 96 east. Photo taken 11/06/11. Exit 162 departs I-96 east for Novi Road as a diagrammatic overhead outlines the forthcoming movements of the back to back wye interchange with I-696 (W.P. Reuther Freeway) east and trumpet interchange with M-5 north. Photo taken 11/06/11. The left three lanes default onto Interstate 696 east, which connects I-96 with M-5 (Grand River Avenue) southeast to Detroit and I-94 east to Port Huron. The right two lanes carry I-96 east along side Interstate 275 south through Farmington Hills and Livonia. Photo taken 11/06/11. Meadowbrook Road spans Interstate 96 east at the split with I-696. Interstate 696 quickly splits thereafter with M-5 (Grand River Avenue) south. M-5 east from I-696 is the historical alignment of Interstate 96. Photo taken 11/06/11. The first in a series of diagrammatic signs for the interchange complex with Interstate 696 (Walter P. Reuther Freeway) and M-5 was posted at the off-ramp (Exit 167) to Eight Mile Road on I-96 west & 275 north. Separate panels for the I-96 pull through and I-696 and M-5 (Grand River Avenue) were installed here by 2011. Photo taken 11/07/09. Nearing the Nine Mile Road underpass, Interstates 96 & 275 partition in one mile into separate roadways. I-96 branches to the west along a sweeping ramp to Novi and Lansing with Exit 165 forming a collector distributor roadway to M-5 and I-696 east. Photo taken 11/07/09. Separate panels were installed on this sign bridge by 2011, showing a single lane for M-5 north and two lanes for I-696 east to Port Huron (via I-94 east) and M-5 south to Grand River Avenue. Photo taken 11/07/09. Traffic partitions at Exit 165 as Interstate 275 north concludes. Three ramps depart in succession from the c/d roadway, with the first departing for the M-5 freeway east to the city of Farmington. M-5 north from I-696 travels initially as a freeway, then as an at-grade expressway to Pontiac Trail. Photo taken 11/07/09. An Interstate 275 end shield assembly stands as the freeway bisects an industrial area south of Ten Mile Road. Photo taken 11/07/09. M-5 south partitions with a two-lane c/d roadway at 12 Mile Road. The pull through panel referenced the upcoming trumpet interchange with Interstate 96 and 275. Interests to I-96 west for Lansing must use the c/d roadway as the remainder of M-5 south turns east at I-696. Photo taken by Frank Gillon, Jr. (05/20/07). M-5 south becomes M-5 east as it transitions to the freeway spurring east from Interstate 696 to Farmington Hills. Just beyond the bridges across the Walter P. Reuther Freeway is the slip ramp onto adjacent Interstate 96 east & 275 south. Photo taken by Frank Gillon, Jr. (05/20/07). Interstate 96 turns south from Novi to Livonia as it travels along side Interstate 275 to the M-14 freeway. I-275 provides a bypass of Detroit for the 60-mile drive to Toledo, Ohio. Motorists remaining along M-5 east next meet a loop ramp for Interstate 696 east to Smithfield, Warren and St. Clair Shores. Photo taken by Frank Gillon, Jr. (05/20/07). An inverted trumpet style interchange provides full access between Interstate 275 south and I-75 leading back north to Wayne County and Detroit and continuing south to Monroe and Toledo, Ohio. A similar interchange joins the south end of Interstate 390 with I-86 in Upstate New York. Photo taken 11/07/09. Labo Road passes over head as Exit 2 departs Interstate 275 south for U.S. 24 (Telegraph Road). Two miles of I-275 remain as the freeway reduces from six to four lanes. This set of signs was replaced by 2011 to use Clearview font. Photo taken by Dan Garnell (07/27/07). I-275 advances southward to within three quarters of a mile of Interstate 75 at Newport Road. This sign was also replaced by 2011. Photo taken by Dan Garnell (07/27/07). Two lanes default traffic onto I-75 south for the rural trek to Toledo. This set of signs was replaced by 2009. Photos taken by Dan Garnell (07/27/07). Interstate 75 south at Newport and Exit 21, 0.75 miles north of Interstate 275. Since I-275 in effect does a U-turn for motorists on I-75 south, no control point is used in this direction. Photo taken 11/07/09. The on-ramp from Newport Road adds a fourth southbound lane to Exit 20 with Interstate 275 north. Photo taken 11/07/09. Interstate 275 leads back to the north toward U.S. 24 (Telegraph Road), Carleton and Romulus while I-75 advances southward to the Monroe bypass. Photo taken 11/07/09. This set of signs posted at the folded diamond interchange (Exit 21) with Newport Road was replaced with Clearview font based panels by 2009. Photo by Dan Garnell (05/05/07). Subsequent signs for Interstate 275 north were replaced by 2009. Photo by Dan Garnell (05/05/07). I-75 crosses Little Swan Creek at the off-ramp (Exit 20) for Interstate 275 north. The suburban freeway passes between a number manufactured home communities just to the west. Photo by Dan Garnell (05/05/07). Interstate 75 northbound at the split with Interstate 275 north (Exit 20). I-75 continues northwest towards the city of Detroit, while I-275 takes a northerly track to Interstate 94 at Romulus. This set of signs was carbon copied by 2008. Reconstruction of the I-75 pavement here in 2015 resulted in the removal of the sign bridge. Photo by Carter Buchanan (11/14/04). “I-75 Traffic Is Routed Directly toledo.” Toledo Blade, November 12, 1971. “Opening Of I-275 Link Lessens Driving Time To Metro Airport.” Toledo Blade, November 12, 1971. “Michigan Expressway Changes Prompt New Look By Toledo.” Toledo Blade, March 18, 1977. Highways 250 through 696, Michigan Highways (Christopher Bessert).